If your trip start date is MORE than 15 days away– an initial deposit of 50% of your quoted trip price is necessary to confirm your booking (the remaining 50% to be paid at least 15 days prior to your departure). If your trip start date is LESS than 15 days away– FULL PAYMENT of your quoted trip price is necessary to confirm your trip booking. 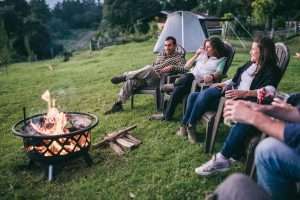 More than 45 days prior to trip start date: Any cancellation fees, surcharges, or nonrefundable deposits charged to Trek Guatemala by individual hotels or other third parties will be charged. Additionally, a cancellation fee of 10% of the total trip cost will apply. The remainder of any deposits paid to Trek Guatemala will be refunded. 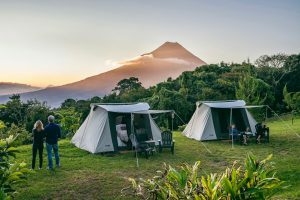 45-15 days prior to trip start date: Any cancellation fees, surcharges, or nonrefundable deposits charged to Trek Guatemala by individual hotels or other third parties will be charged. Additionally, a cancellation fee of 25% of the total trip cost will apply. The remainder of any deposits or payments paid to Trek Guatemala will be refunded. Less than 15 days prior to trip start date: No refunds can be issued for trips cancelled in this time period. All payments made to Trek Guatemala will be retained. All refunds are made in accordance with our Cancellation Policy outlined above. In addition, please be aware that any additional bank transfer or credit card fees to issue the refund will be deducted from the total amount. Additional refunds CANNOT be made for “no-shows” or any unused part of an itinerary whether voluntary, caused by airline delay or cancellation, or any other factor beyond the control of Trek Guatemala. This includes, but is not limited to: acts of God (sickness, injury, poor health, weather, etc.) strike, detention, riot, war, quarantine, theft, civil disturbances, government regulations or restrictions, third-party or subcontractor negligence, or any other. No responsibility can be accepted for expenses incurred due to delay or change in schedule or other causes. Join An Upcoming Trip & Save! 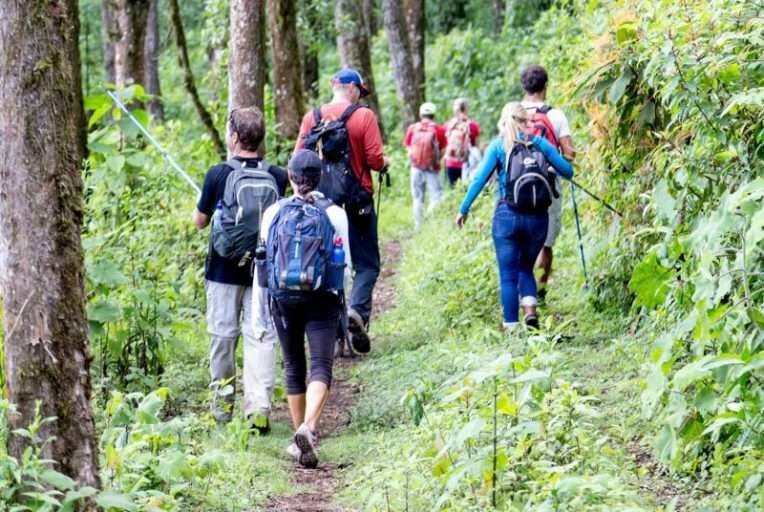 Antigua to Lake Atitlán Trek If you’re looking for a complimentary trekking adventure to add to your trip, consider Trek Guatemala’s four-day “Sky Route Trek” between Guatemala’s most beautiful and inspiring destinations: Antigua and Lake Atitlán. 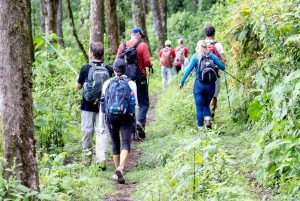 The trek takes you through cloud forest, coffee fincas and friendly Mayan villages. 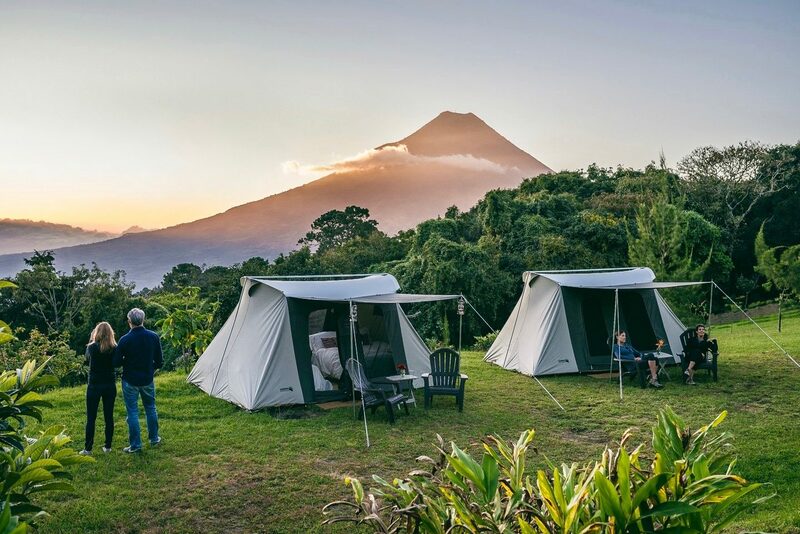 You’ll hike with just a day pack while each night your luggage awaits at our mobile safari-style tent camp featuring queen beds, hot showers, cold beers and great food. Along the way, you’ll be accompanied by one of our qualified guides as you’re immersed in the sights and sounds of Guatemala’s living Mayan culture and remarkable landscapes. 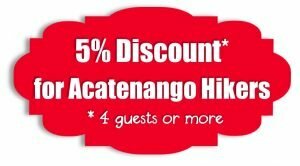 Discounted prices for Acatenango hikers!